Curious Kids: why do some people find some foods yummy but others find the same foods yucky? Why do some people find some foods yummy while others find the same foods taste yucky? – Emilia Bennett, aged 7, and Jessamy Bennett, aged 10. Some people love coriander, others hate it. You might like olives, but maybe your dad thinks they’re disgusting. To understand why, you have to delve a little into the science of evolution, chemistry and biology. Being able to taste helps you choose foods that provide the energy or nutrients your body needs, and avoid eating things that provide no energy, like a bicycle*. In other situations, a bad taste can be a warning sign to put down harmful or toxic foods. That’s why some poisonous things, like certain wild mushrooms, have a sharp or bitter taste. Why do I like blue cheese, but my friends don’t? There are many reasons why you may like a food and your friend might not. The first is your own DNA sequence. A DNA sequence is like a recipe that tells your body how to make proteins, which are one of the most important building blocks in your body. Each person has their own DNA sequence, or recipe, that is different to everyone else. DNA helps determine how you taste and smell and the messages sent to your brain about what’s nice and what’s not. So each of us taste the flavour of food differently. 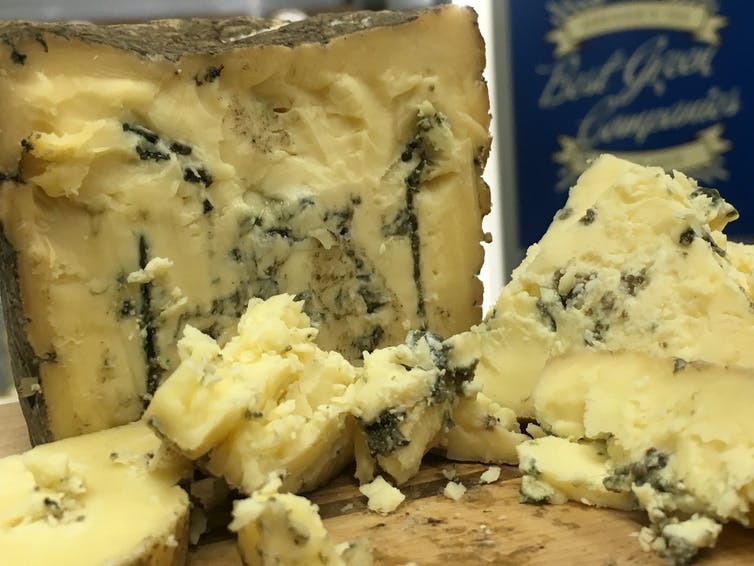 Scientists have even worked out that differences in your DNA can affect how you feel about the smell of blue cheese (specifically, there’s a chemical called “isovaleric acid” that helps your body decide how it feels about that particular smell). And you can also blame your DNA for how you feel about the taste of brussels sprouts or broccoli. But it’s not just about what genes you’re born with. It also depends on how familiar you are with the food and if you have eaten it before. Vegemite is a good example, where if you have grown up with it (and if you know that you’re only supposed to eat a little bit at a time), you are more likely to think it tastes nice. Finally, your environment can impact your choices. If you are feeling unwell or you just ate food, your tastes can change – you might suddenly feel like you just do not want anything spicy or greasy that day. These three reasons (your DNA, past food experiences and your environment) help decide the foods you like or dislike. Taste preferences start building before you were born, where the food flavours your mum ate were sent to you as you were growing in her womb. This first-taste experience has an impact on your food choices in childhood. But your likes and dislikes are not permanent; as we age, our taste changes. We may also learn to like foods that taste yucky by trying them again and again or we can dislike foods when we have a bad experience with them – such as if a bad egg makes you sick and you decide never to eat eggs again, even though you liked them before. As you can see, understanding why you like the foods that others find yucky is complicated and there are many scientists across the globe trying to understand why. Now you have learnt that tastes can change, remember that the foods you hate now may one day end up being your favourites. *CSIRO does not condone the eating of bicycles. The solar panel and battery revolution: how will your state measure up? Can billions of litres of coal seam gas water be safely reinjected into the ground? We love hearing from you, but we have a few guidelines. Got a sticky beak for science? Get all the latest science news delivered straight to your inbox, in whatever way suits you. I can't wait a whole week, give me news every day!